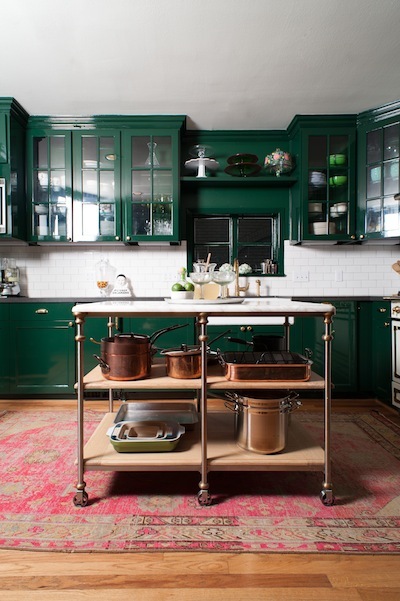 I'm noticing a trend lately that I can totally get on board with... green cabinetry. I know that sage green and more muted tones have likely been popular for years, but I'm talking GREEN green. My green. Bold green. 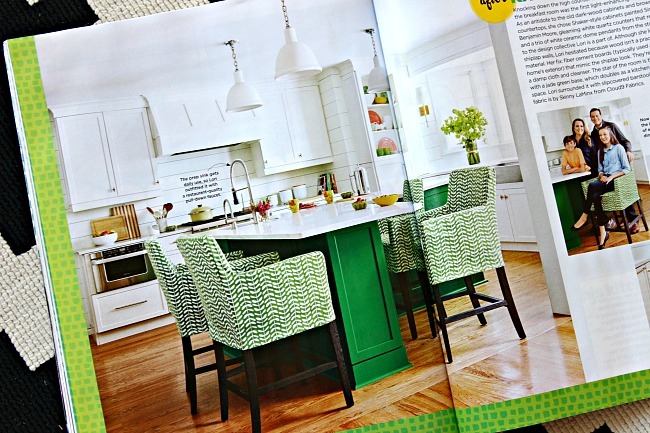 While looking through this month's HGTV magazine, this kitchen stopped me in my tracks! I studied each detail and was SO drawn to that gorgeous green island. Right then and there I got up and looked at my kitchen and wondered if I could do the same. Sadly, I don't think it would work with my current kitchen countertops, but I've tucked this idea away for the future for sure. I've been looking to replace my barstools, though, and those are certainly inspiring me! 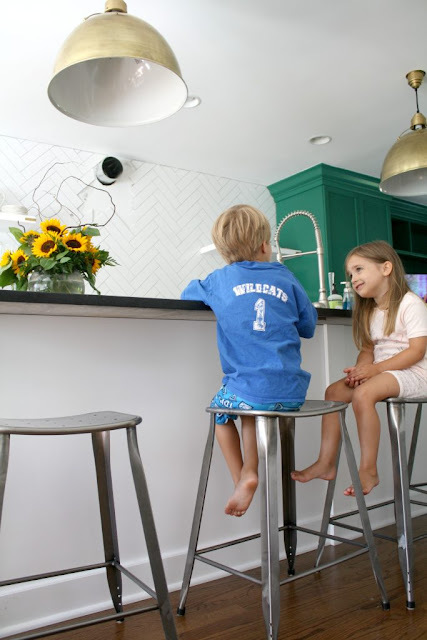 Here's a peek of one corner of the kitchen via Style Me Pretty (photographed by Alyssa Rosenheck)- see the post for more photos and information on the design. 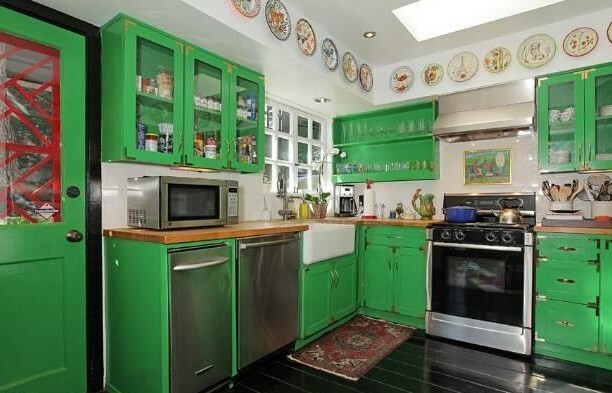 Kitchens aren't the only place green cabinets are turning up. How gorgeous is this bathroom? I give this color combo two thumbs up. 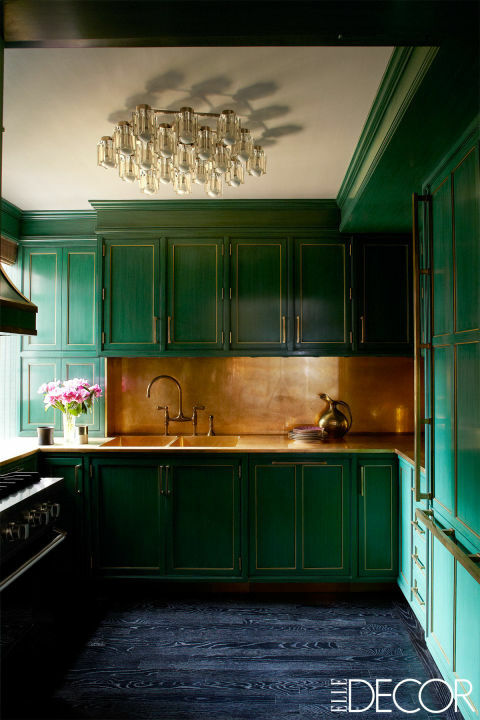 A variation that I'm also loving is a deep, rich, moody toned green. Lindsay from The White Buffalo Styling Company just revealed her gorgeous new kitchen, full of lovely green/blue/gray cabinets, metallic and wood accents, and that stunning vintage runner. 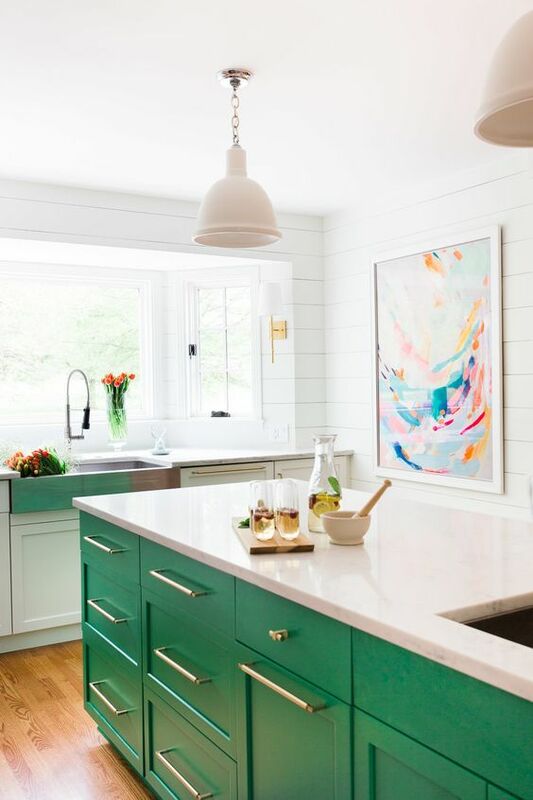 Afraid of color on your cabinets? I think the key in most of these photos is lots of light/white mixed in with a saturated dose of color. 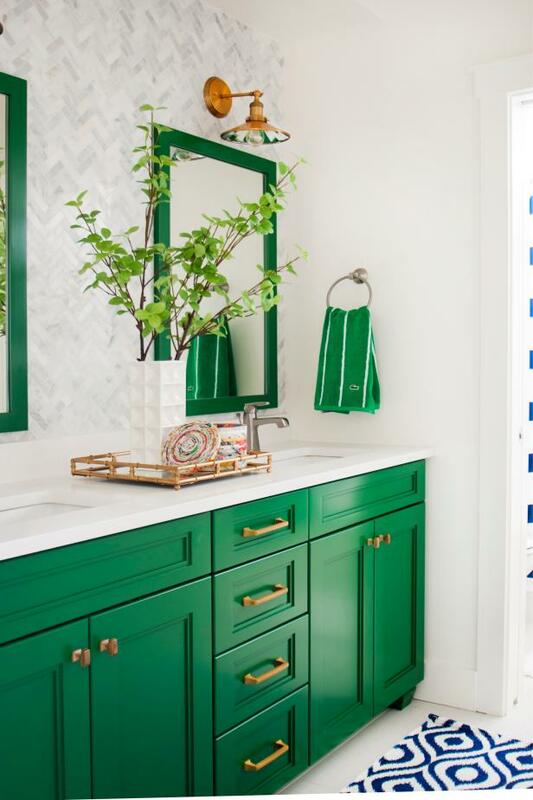 An island is always a "safe" play to experiment with color, or like the photo above a bold color on a bathroom vanity could be a good jumping off point. What do you think? Would you/have you used a bold color (maybe green!) on any cabinets? 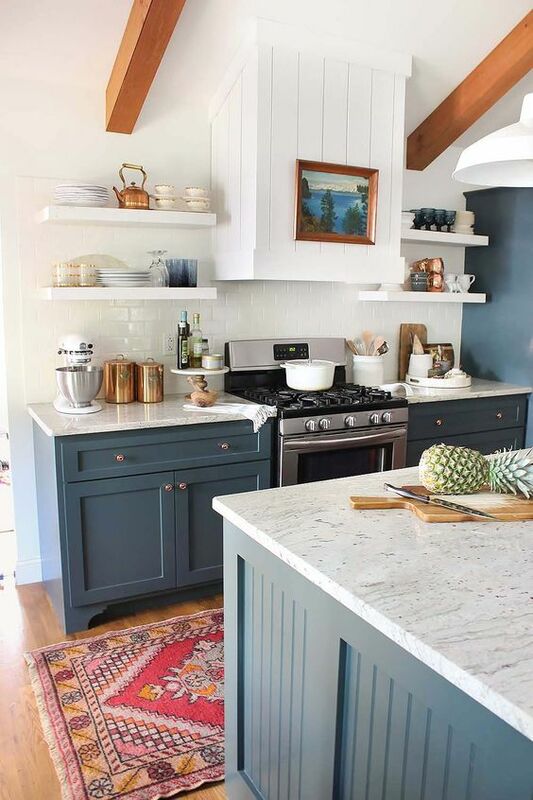 I love it in a kitchen as well and had we not chosen grey for our kitchen, I would have definitely went with something like Lindsey @ White Buffalo Styling Co! Love her style and she's actually helping one of my dear friends in Greenville, SC. I can't wait to see what they come up with for her new living room design! 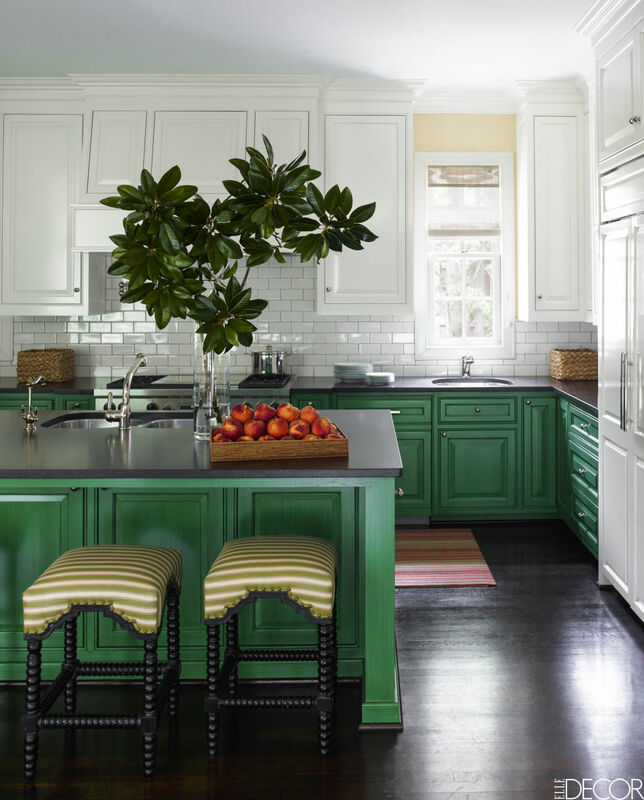 There is nothing that me smile more than a big, bold green splashed about a room! I notice another commenter has mentioned the Show House currently open here in Birmingham. While it is undeniably stunning, it is too dark for my taste. The ceilings, walls and EVERYTHING are painted dark green. I would be trying to cook with a flashlight in my pocket in there! I like a lot of these you have shown because we all love your green china cabinet. 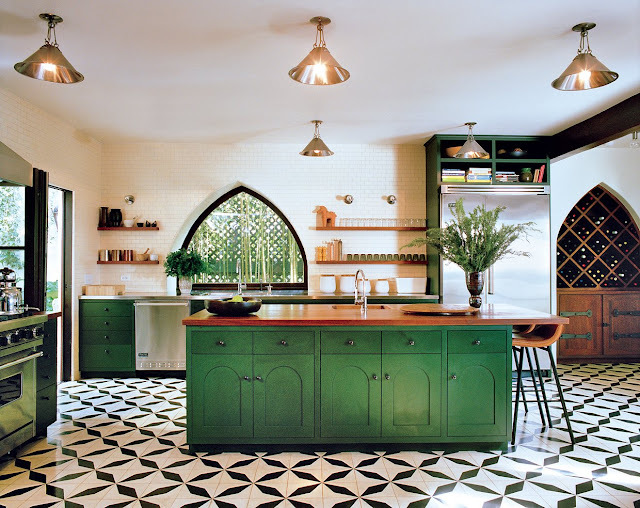 You should look at the kitchen on Addicted 2 Decorating blog, too. Looks great, but I'm afraid I might tire of it quickly! 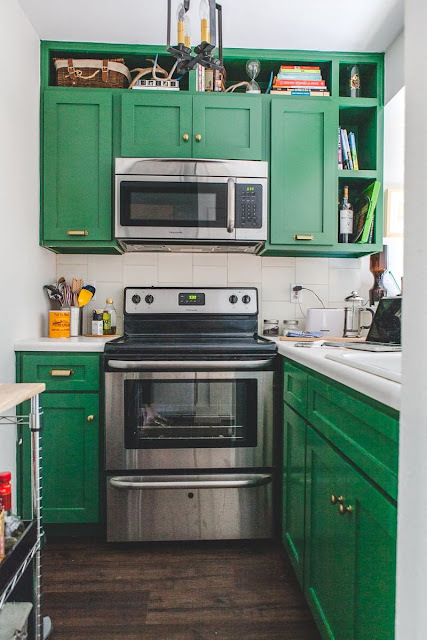 Though, and island or a pantry cabinet painted in a saturated color might not be a bad idea since it will be quick switcheroo once you tire of the color. 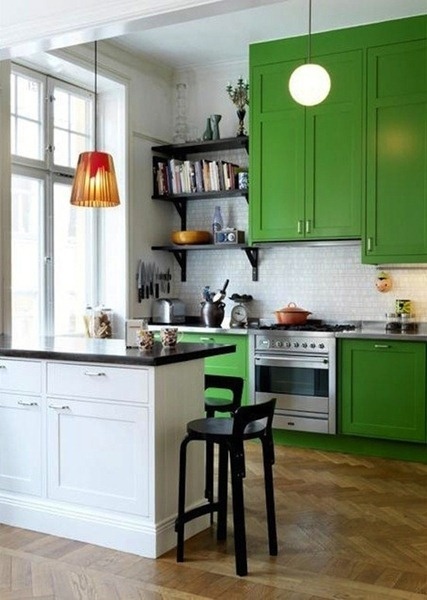 Green color also have a major impact in my home. everything looks so pretty...especially love your cabinet doors. I agree with Scribbler you should really visit Addicted 2 Decorating she has designed and built a beautiful kitchen using stock cabinets. She is a huge inspiration to anyone trying to do it yourself.